Eroticism isn't something that the British cinema tackles very often, but this 1962 offering does. 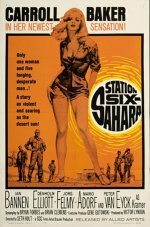 It's set on an oil pipeline in the middle of the Sahara where the blokes are muscular, sweaty and bad-tempered. Their frustration is palpable. Then out of the blue comes Baby Doll herself, a provocative, unbuttoned Carroll Baker and ... well, the oil gushes right out of the tube. Directed by former editor Seth Holt and co-written by Bryan Forbes - who neglects to mention it in his autobiography - it makes the absolute most of an intrinsically ridiculous situation, relishing the clichés, laying on the impudent symbolism and wringing out as much sexual tension as possible. A real collector's item.